The 1 is a frequent link between the North West's greatest port city and its very oldest city, running via tourist attractions and shopping destinations that the parallel railway line just can't reach. It runs every 20 minutes every daytime and half-hourly each evening. It's operated by Stagecoach. 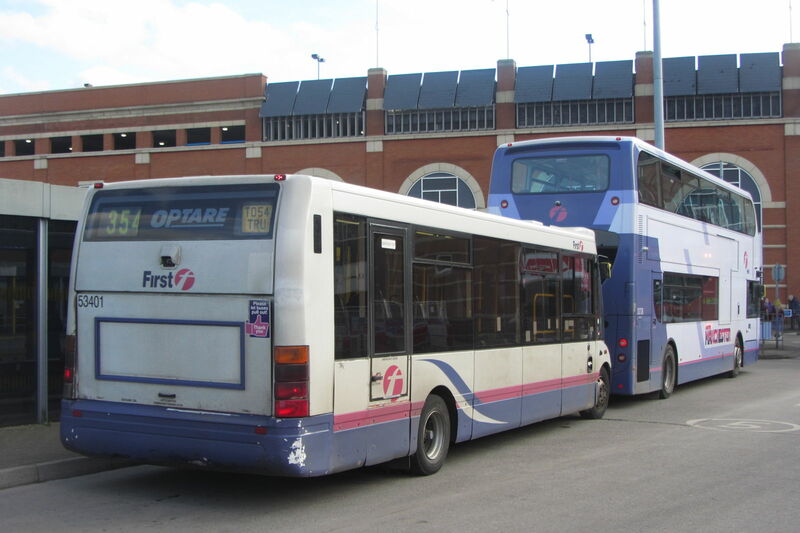 Click here to discover other bus routes in the North West. See the full Merseytravel map of bus routes throughout the Borough of Wirral here. Click here for Birkenhead's attractions, including Birkenhead Priory and the Tramway & Transport Museum. A short walk away is Port Sunlight, a Victorian model village built to house soap factory workers. Find out all about it in the museum. Bromorough's best-rated restaurant is the Wirral Tandoori on Bromborough Village Road, just north of these stops. Why not stop for a bite to eat at The Montgomery, a short walk from the bus stop at the junction with Bridle Road? Here we cross from Wirral, Merseyside into Cheshire West and Chester. Click here for comprehensive maps of all bus routes in the borough. The 1 follows Chester Road through Little Sutton, stopping not far from the railway station, useful for interchanging with Merseyrail's Ellesmere Port branch. At Ellesmere Port Bus Station, buses to Chester use stand 1 and buses to Liverpool use stand 4. While here, take a short walk through the town and along the Shropshire Union Canal to the National Waterways Museum. The station entrances are to the right of the arch. The building behind the bus stop is the Morrisons supermarket. Buses towards Liverpool stop on the other side of the road. If arriving by rail in Chester itself, be prepared for a walk, because the railway station is not really in the city centre. The 1 doesn't serve the railway station but terminates at the Bus Exchange which is a lot more central. There used to be a free bus between the two, but no longer. If you want to connect between the 1 and the trains, use Bache or Little Sutton stations. Click here for Chester's official tourism site. Things to see and do include the Roman City Walls, the cathedral and the racecourse. At Chester's gleaming new Bus Interchange, the 1 departs from stand K.
See the full timetable courtesy of Stagecoach, Merseytravel or Traveline. For details of single and return fares, contact Stagecoach by e-mail or by calling their Birkenhead depot on 0151 654 8661. The Chester Dayrider at £2.80 is only valid between Chester and Upton (i.e. not valid to Chester Zoo). If you're travelling from further afield, NorthWest Explorer at £11 (for travel from Preston, Lancaster, Cumbria or even Newcastle-upon-Tyne!) is valid and available to buy throughout route 1. If you need to use other bus operators on other routes and will only be travelling within Merseyside (that's between Liverpool and Hooton on the 1), then a Merseytravel Saveaway ticket is the one you need. It's also valid on trains. An Area B Saveaway is valid on the 1 between Birkenhead and Hooton and costs £3.90. An All Zones Saveaway, valid throughout Merseyside (on the 1 that's Liverpool to Hooton only) is £5.20. It is also valid for travel to Ellesmere Port and Chester, but by train only. Saveaway cannot be purchased on the bus, but is available from all staffed railway stations and Merseytravel Centres in the region, as well as most libraries and many local shops (look for the Merseytravel logo, shown above). If travelling by train, you can also buy a Birkenhead, Ellesmere Port or Chester Plusbus with your rail ticket. The Birkenhead Plusbus ticket has the same validity as an Area B Saveaway from Merseytravel, which on the 1 means Birkenhead to Hooton only. The Ellesmere Port Plusbus is only valid over a small area, but is still good value for visitors to Cheshire Oaks or the Blue Planet Aquarium. Tip: Change to the 1 bus at Little Sutton for a shorter walk between train and bus. your train ticket must still be valid to Ellesmere Port in order to buy the Plusbus however. Please note this ticket is not valid to Chester Zoo. The Chester Plusbus is valid on the 1 between Chester Bus Exchange and Chester Zoo. Be warned though that some will find the walk between Chester railway station and the Bus Exchange too far. My tip: If travelling in on the Wirral Line, get off early at Bache and catch the 1 from there: it stops right outside the station. Your rail ticket must still be valid to Chester in order to buy a Plusbus. In Liverpool there are buses in all directions, including Stagecoach X2 to Southport and Preston. Merseytravel has details of all bus routes in Liverpool including the city centre's bus stops. The 1 also stops near Moorfields and Lime Street railway stations. For bus connections from Birkenhead, see Merseytravel's Wirral public transport map. Birkenhead Bus Station is near Conway Park railway station for Merseyrail trains towards New Brighton and West Kirby. The 1 also stops near Birkenhead Central station for trains towards Ellesmere Port and Chester. Little Sutton station is a convenient interchange for trains on the Ellesmere Port line. Ellesmere Port Bus Station is a major hub. Click here for details of the services you can connect to. Bache station is the best place to switch between bus and train on Merseyrail's Chester branch. Quicker journeys are provided along much of the route by Stagecoach X8. Route 2 only has a few variations from the 1's route. Ticketing arrangements are the same as for the 1. Merseyrail's Wirral Line has trains from Liverpool to Ellesmere Port and Chester. The All Zone Saveaway at £5.20 is valid throughout these lines. Anyone who buys a normal rail ticket from Liverpool to Chester will be ripped off to the tune of £7.05 single or £7.35 return without a railcard. Look up other rail fares here.